Loopmasters return once again to the Reel People studio for a brand new collection of Funky Soul and Jazz featuring blistering performances by some of the best session musicians in the business today, recorded and produced exclusively for Loopmasters by Reel People leader and founder of Papa Records Oli Lazarus. Following on from the insanely brilliant Broken Beat: Nu Jazz & Soul series, Sounds For The Soul features over 300 Loops and 200 One Shot samples dedicated to Lounge, Chill, Funk and Broken Beat producers looking for those hard to find rare recordings of real musicians that are 100% in the moment and playing the living soul out of their instruments. The Collection features a wealth of royalty free Drum Break samples, Live Bass and Guitar Loops, Silky Flute and Brass Riffs, Crispy Percussion and Hooky Keys, plus a wonderful collection of hits and stabs for Drums, SFX and Chords. Also included in the Apple Loop version is the special Logic X Demo song arrangement put together by Oli himself. In detail you will find 696Mb of 24Bit 44.1Khz loops and Sounds including 116 Drum Loops, 42 Percussion Loops, 11 Electric Bass Guitar Loops, 23 Synth Bass Loops, 11 Flute Loops, 8 Brass Loops, 51 Electric Guitar Loops, 71 Keys Loops, 181 Drum Shots, 10 SFX Hits, 15 Chord Shots, 333 Rex2 Files, 34 Soft Sampler Patches for Kontakt, Halion, Exs24, Nnxt and Sfz formats. This collection is also available in Apple Loops, Ableton Live pack and Reason Refill formats. The Apple Loop Version also includes the Logic X project that was created for the Demo song. 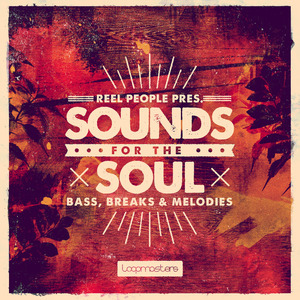 If you make Lounge, Chill, Broken Beat, NU Jazz or Soulful and Deep House Music, then the Reel People collections are something you really should be aware of - these sounds are all played by some of the deepest and most culturally talented and conscious musicians on the planet, so check out the demos and sample Reel People Sounds For The Soul TODAY!